We’re touring the country to share the love of travel and inspire others to satisfy their wanderlust! We truly hope you can join us at any of the following events. Let us know which travel talks, Nat Geo book signings, and parties you can make in the comments below. If you can’t make any of these, leave a comment with your city and we’ll try to add your stop on our cross-continent road trip! We’re excited to get you started on your latest adventure, whether that involves catching the northern lights (without freezing) in Scandinavia, watching baby sea turtles take their first steps in Central America, hiking the Himalayas ablaze in pink rhododendron, and other unforgettable experiences. Using the calendar to help you plan effectively, they pinpoint the ideal times to go to each place for the best weather, cultural offerings, lowest prices, and fewest tourists. Get your passports ready and find your next destination. Come celebrate with Mike & Anne as they toast the launch of their National Geographic book. Chat with the authors, enjoy the photography show, and get a signed copy of the book. As former New Jersey residents, Mike & Anne’s hometown realty company, PRIME REG, is kindly hosting the event in their cool new gallery space. Born and raised in LA, Anne could not be more excited to give a talk in her city’s premier independent book store. Join both Anne & Mike as they share their favorite destinations and best travel tips from Ultimate Journeys for Two. One of San Francisco’s most beloved bookstore, The Booksmith, is hosting this travel talk in their hip new event space, The Bindery! Kick back on the couches, talk travel, and stay for the book signing. 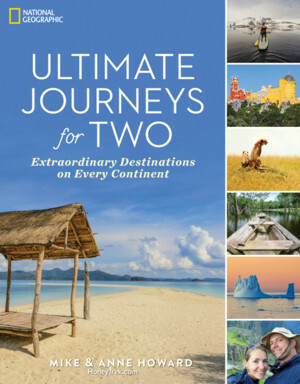 Join us for an evening of travel inspiration, tips, and tricks as we chat about our new Nat Geo book, Ultimate Journeys for Two. The event will begin at Ravenna’s beloved indie bookstore then head down to the Pub at Third Place with the jetsetters from Travel Massive Seattle. We’re honored this chapter of the world’s largest network of travel industry changemakers has made our talk their September event! When we started packing for our trip around the world, we went to REI SoHo to gear up. Six years later, we are honored to return to the flagship store to give the travel talk, “New Yorkers to Nomads.” In this inspirational and practical lecture, we’ll share how we made the bold move out of NYC, what keeps us on the road, how we can afford a 2,000 day-long honeymoon, and how you can get out there on your own journey (be 2 weeks or 2 years). Event Details:. Note RSVP required for this free event. Memphis’ hot new art and community space Crosstown Concourse, has invited us to give a travel talk! We’ll be in the 430 Crosstown Arts and have the space rented all afternoon, so come chat travel and stay for refreshments. Bonus: Anne’s entire family will be in town for this event so you’ll get to meet the Collins crew! When: Wednesday, November 22nd at 12pm. Where: Crosstown Arts, 430 N. Cleveland, Memphis TN. We will be updating this page throughout the next year, so check back for a travel talk and book signing near you! No stops in the middle of the country? Chicago maybe? What bookstores or travel-related venues should we hit up in Chicago, Amy? HOW WONDERFUL !! Congratulations dear fellow travelers.I hope to chat with you soon on the telephone. Also alerting a friend in New Jersey in, hope she can attend on Sept 6th. A BOOK with the National Geographic logo! … Now all can share and learn from your travels . Any mention of our meeting at the Beijing Acrobat show? oh the Beijing acrobat show! We have a few Chinese destinations in here you would love, Marjorie. So great to hear from you and thank you the support and for spreading the word! If you are passing by on 95, shower and laundry always open in Havre de Grace, MD! If you come to Connecticut, Wesleyan R.J. Julia is a great bookstore. It’s Mr. Toad at Toad Hall. I bought four books and having a fabulous time reading the adventures and enjoying the awesome photographs. I hope you will put Hawaii on your signing list. Your book makes a great Christmas present for traveling friends and even stay at home readers that enjoy traveling the world through your experiences and eyes. Toad! You are so sweet to buy so many copies. We are thrilled you are enjoying the book! We’ll gladly do a reading in Hawaii 🙂 Love and aloha to you! Oh! Please come to The Bookworm in Omaha or Rainy Day Books in Kansas City. Great suggestions! We’ll hope to be heading that way in spring! So good to hear! We posted our heart out for Quebec on social media. Did you see our HoneyTrek Instagram Stories or Facebook posts? 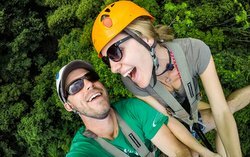 Check ’em out: http://www.Facebook.com/HoneyTrek and, of course, let us know if you have any questions! Love this! We won’t be far from you in later November – see you’ll be in Memphis and we’ll be in Nashville end November. If you’re in the area, let;s stay in touch and see if paths cross! Hey guys. That post was from our last book tour. But ironically we will be in Tennessee at the end of December when we fly back from Belize, where will you guys be for the Holidays?